There were very, very few toys I had to re-purchase as an adult because most of what I got rid of, I wanted to be rid of. Not so with the Fisher-Price Alpha Star and its many figures inside, specifically, the alien creature, the robot, and the astronaut. 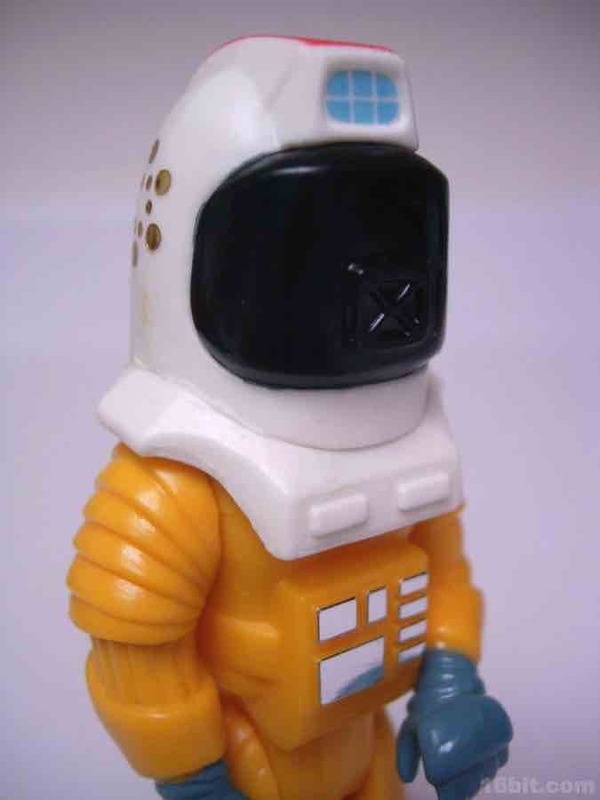 For the sake of the column, I'm treating the item like a set built around the astronaut, but in reality it's a large vehicle packed with toys-- it really is a complete play pattern in a box with everything you might want other than a spare astronaut or two to fill all the seats. 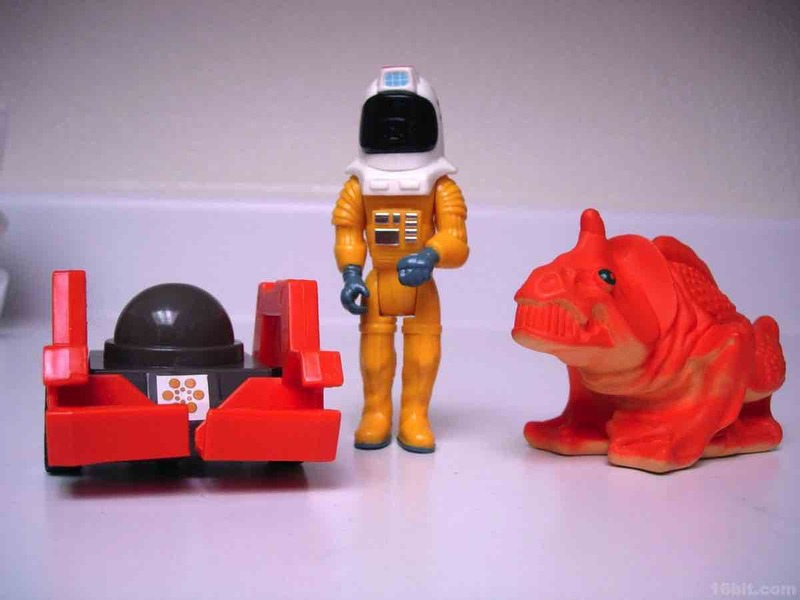 Fisher-Price actually played around in the world of 3 3/4-inch action figures for a bit, constructing figures and vehicles based on reality and, in this case, science fiction. The vehicles worked well with a lot of similarly sized lines, and I often incorporated this set with Star Wars because I had no Millennium Falcon and the Alpha Star had two seats-- it gave Han Solo and Chewbacca something to do. The ship itself is one big space camper, essentially a car that tows a trailer with a robot, a claw, a camera, sensing equipment, and a "prison pod" for an alien creature. I was so enamored with the creature that I actually stumbled on some prototypes of the toy in the early 2000s, which are now deep within the 16bit.com archives. The astronaut is about 3 3/4-inches tall, and has limited articulation. This sample was removed from a sealed box about 10 years ago, which is why it's in killer shape. 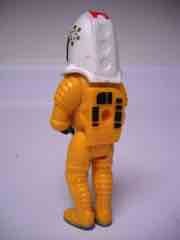 The figure's head can rock back and forth, the shoulders and hips are jointed, and that's about it. 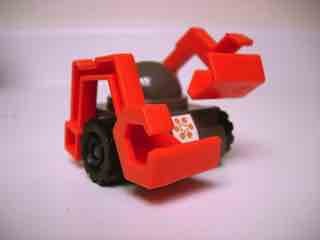 By modern standards people wouldn't give the figure a second look, but it performed its function as a toy-- he could climb up his camera, he could ride in his vehicle, and there was a plug in the back so you could attach him to other compatible toys in the line. 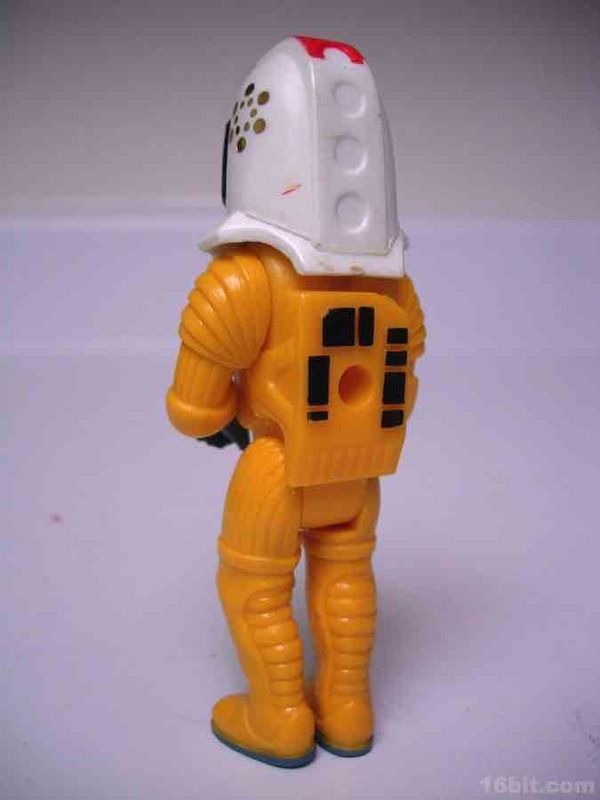 His yellow suit and blue gloves weren't at all realistic, nor was his bulky helmet with goldmetalized detailing on the sides. 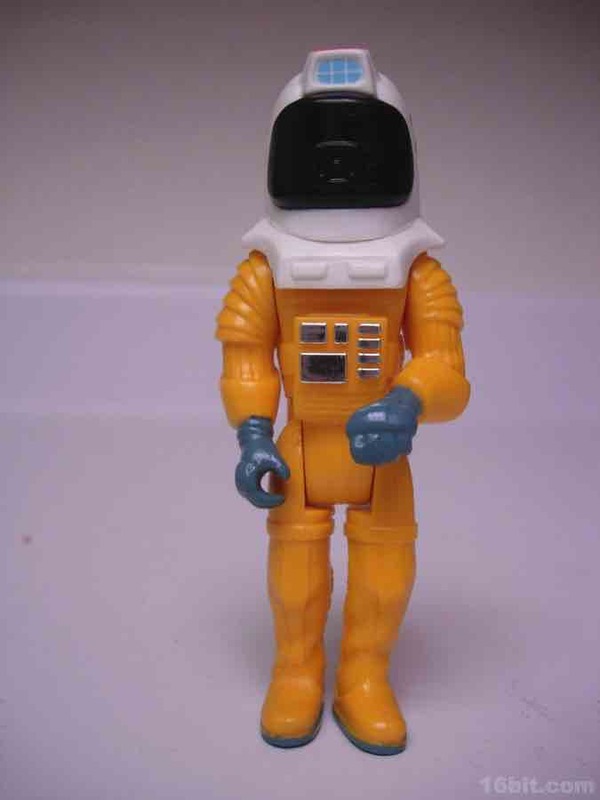 The deco on the figure looks expensive, there's an unusual amount of color painted on this guy including a red stripe on the top of his helmet and even paint on the soles of his boots-- again, very uncommon for the 1980s, particularly for a toddler's action figure line. I'm not quite sure what the inspiration was for this figure, but I've always loved it (and the whole set) and really, this is just an excuse to show it to you. The alien creature is effectively a non-squeaking squeak toy. 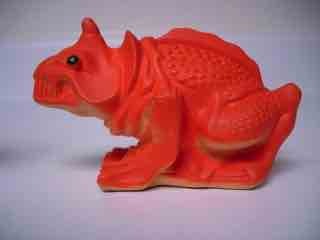 It's hollow and has a hole on the bottom, and the frog/dinosaur hybrid is made of a soft, squeezable plastic. 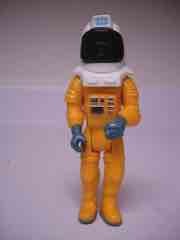 Molded in yellow, he has red skin and green eyes, plus some genuinely freaky teeth. I'm not sure what they were going for-- needles, baleen, or what... but it's unlike any other space toy I saw as a kid, and I always thought this was an amazing little creature. I've owned a grand total of three of these, and all have been colored this way-- however I have seen images online of one molded in orange plastic with green eyes, and I don't know what his story was. Rounding out the "accessories" is a little robot which seems inspired by a number of the late 1970s and early 1980s sci-fi films. A round dome seems similar to R2-D2 in some ways, and his big wheels help him zip along to pick up whatever it is kids decided he needed to examine with those giant, articulated orange claws. 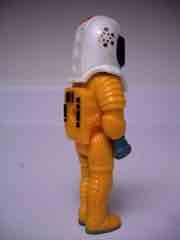 The figure was molded in grey and orange, with the only additional decoration being a single sticker. The neat thing about the robot is that there was a compartment in the back of the vehicle to store him, and when you pushed a button, the hatch turned into a ramp and "launched" the figure onto a strange alien world. Simple, but lots of fun. 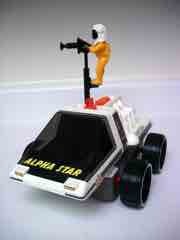 The reason to buy these figures is the giant vehicle, the Alpha Star, which I could go on about for hours. Sadly, this is a short-form column and without deadlines, I'll never get to sleep. So the short version is this: there's a four-wheel vehicle with push-movement or battery-powered movement, whatever tickles your fancy. You can push a button to determine if it goes forward or backward, or just push it. 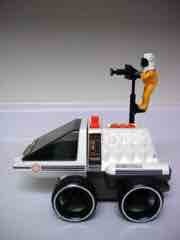 There's a steering lever on top of the vehicle, and the entire cockpit is a removable secondary vehicle which can be an escape pod or whatever you imagine. This front vehicle connects to a non-electronic trailer (not shown), which features storage bays for the alien and the robot. There are also places to plug in the rotating camera and a claw arm. There's more to it, and it really is a fine example of how vehicle engineering for action figures in the 1980s is rarely surpassed. Sure, we can get talking AT-ATs with minutes of dialogue and lights galore, but this thing was actually designed to be driven around, played with, and abused-- and still hold together. The entire collection is gorgeous and durable, worthy of the saying "they don't make them like they used to."